Our products are developed to stimulate and educate children, along with providing great educational play value. We have been know previous as Galt America distributors of Galt Toys. Our new company The Original Toy Company strives to bring distinctive products to the American market. The Original Toy Company’s founders (Kevin and Susan McGrath) have been recognized around the world for their commitment to craftsmanship, quality and design. The McGrath’s built and established The Original Toy Company to offer consumers and retailers within the United States a very unique and diverse educational specialty toy line. The McGrath’s strongly believe in traditional toys that not only offer unique play value but also will stimulate the early stages of our children’s lives. Play helps a child to learn about the world and the environment by recognizing shapes, textures, spaces, color and by developing skills, all of which help in the development of intellectual and creative abilities. All of The Original Toy Company products such as our wooden toys, Orchard Toys from England, Bontempi Music from Italy, Gunther Toys from Germany and Dantoy from Denmark are specially designed to encourage and stimulate a child through play in a fun and interesting way. OTC'S commitment to you....."Learning Thru Play"
Using the finest natural materials and strict quality and safety standards make our products an investment purchase you can trust! Each one of our products is produced and manufactured with the respect of the environment in mind 100%. We aim to create all our packaging thru recycled board. E-one glue is used on all wood products in place of traditional wood toxic glue. All inks used in printing our materials are biodegradable. ISO 9001 (Quality Managment)- For achieving world-class product quality and service standards. ATSM (Toy Safety Standard)- For exceeding international toy saftey standards. All our Orchard Toy's games, and jigsaws are manufactured in Britian using thick, durable recycled board. All our Bontempi products are produced without use of PVC and do not contain phthalates. All our Dantoy plastic products are manufactured in Denmark and are produced with out use of PVC and do not contain pthalates. Dantoy is the 1st toy company in the world to receive an Eco label certification- which means all Dantoy products meet strict specifications that benefit the environment and the health of our children. The Original Toy Company products are carefully designed to meet each stage of the growing child's development. We only use the best materials that are suitable for ensuring each toy is of lasting quality. All products are rigorously quality controlled at each stage of manufacture to maintain the utmost standards in quality and safety. Manufacturing on the "Greener Side"
All of our board games and puzzles are packaged in 100% recycled material. The paper used for printed covers for these products are sourced from sustainable forests and coated with a water-based varnish. We strongly believe in giving back to our environment along with protecting it for our children. Look for this logo throughout our site to help connect children with our Special Needs Toys! 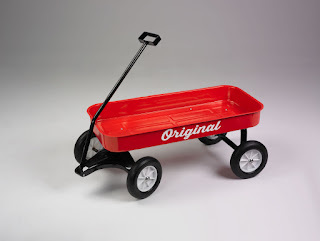 Original Wagon, with classic lines, along with being a exclusive product for the Specialty Toy (Only) Industry. This wagon will provide years of memories and exceptional play value. Original Toy Companys Original Wagon creates hours upon hours of fun! I cannot even tell you all the fun things my kids have come up with to do with this wagon. Whether it be pulling each other around, pulling their stuffed animals around, or using it to help pickup leaves in the backyard, they've had a blast using it. I remember having a wagon like this as a child and have fond memories of my siblings and I using it to do all sorts of things. One thing I absolutely love is that this wagon is that its's built just like the wagon I used back in my day. It's all metal and is built to last. This is a wonderful toy and will create years of memories! Follow the Original Toy Company on Social Media!